"Message Space was paid over £65,000, which including on 5 May – days before the poll – the biggest 1-day-blitz online ad buy in UK political history. One should note that Conservative Home - then under the proprietorship of Tim Montgomerie - was a major beneficiary". It's also worth noting that Douglas Carswell, who has had a recent spat with Arron Banks over the former's support for the Elliott campaign, is also a customer of Message Space. 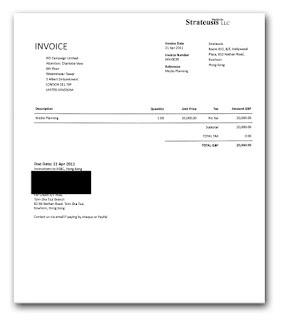 In addition to the £65,000 paid to Message Space (including one invoice for £17,000) Singh then went on to pay Strateusis well over £30,000, a Hong Kong company which he is a director. 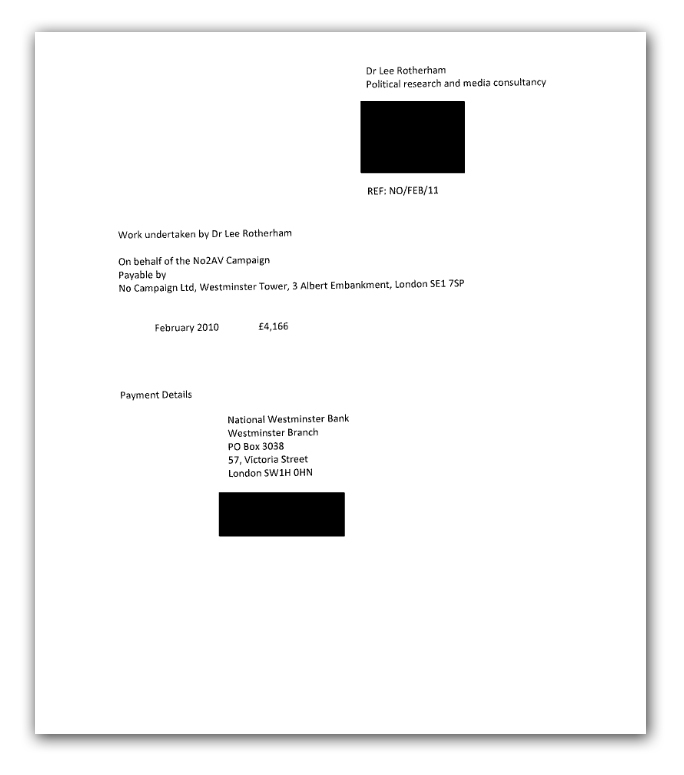 One such invoice, (below) showed a considerable sum of £20,000 for the vague term of "media planning". Interesting using the Hong Kong company meant he paid no tax on the money. 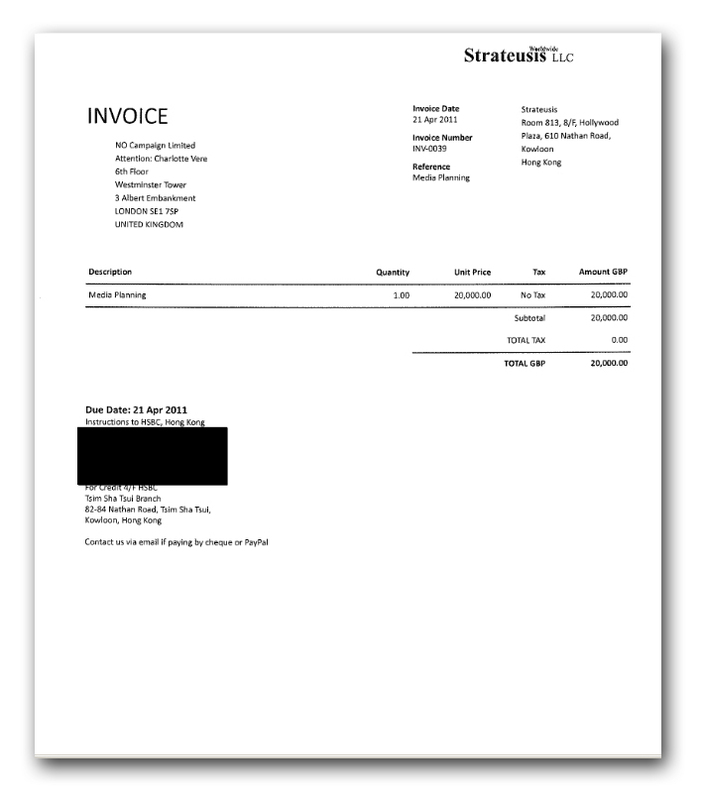 Invoices for Message Space and Strateusis combined amounted to nearly £100,000. Further invoices show yet another close associate of Elliott working for him in the AV Referendum campaign. 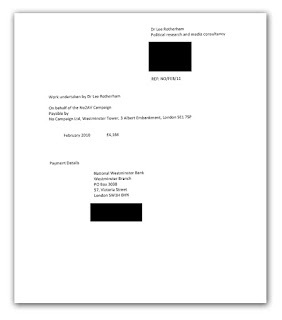 We see that Dr Lee Rotherham was paid £4,166 (below), for "work undertaken". Rotherham advises The Taxpayers' Alliance on EU matters and has written at least two books with Matthew Elliott. It's becoming perfectly clear that Elliott is completely unfit to lead any official leave campaign. Never has he advocated leaving the EU instead arguing that we stay in with unspecified reforms. More serious is the deep suspicion that his campaigns are being constructed largely to allow close friends to award themselves contracts. However as Richard North says "should the [Electoral Commission] decide to ignore warning signs and make the award to the establishment grouping, there is always the prospect of a judicial review in the High Court". EU Referendum: Vote Leave And Plagiarism? 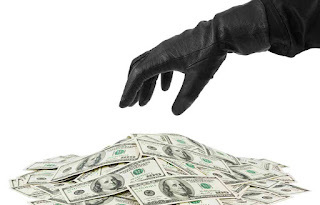 EU Referendum: Guido's Dodgy Data Grab? Guido Fawkes: Vote Leave, Take Control? EU Referendum: Vote To Leave?